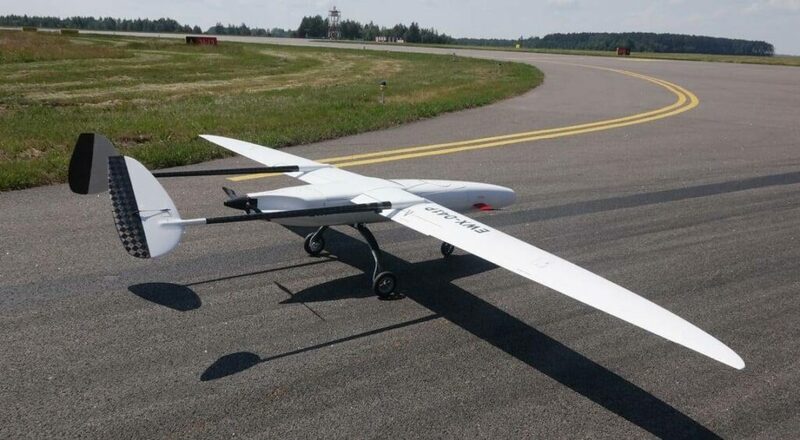 UAVOS Inc. has announced that it has completed a series of test flights with its new Sitaria fixed–wing UAV (unmanned aerial vehicle). The new UAV is designed for patrol and observation missions, and for aerial photography of terrain area with a radius of up to 120 km. It has also been designed to work with a LIDAR airborne laser scanning payload. Sitaria has a stall speed of 65 km/h, and a maximum speed of 150 km/h, allowing the aircraft to carry out missions at minimum flight speeds close to 70 km/h. For example, taking into account a tailwind of 6 m/s, the minimum operational speed of the aircraft will be about 90 km/h. To fulfill a mission using LIDAR it is important to maintain a certain speed relative to the ground. When the UAV performs monitoring while moving against the wind, it will maintain a high air speed. The weight of Sitaria is 35 kg, and it has a wingspan of 5.2 m and a fuselage length of 2.8 m. Flight time with a payload of 4 kg is 3 hours, operating altitude is up to 6000 m. Video transmission range can be up to 60 km; the backup Iridium command line is unlimited in range. The EW countermeasure function provides an opportunity to carry out research under jamming of satellite radio navigation signals and the command line channel. The Sitaria unmanned aerial system also includes a ground control system. The UAV is equipped with an electric motor for less noise and high reliability; low vibration level does not affect the stability of the payload. Sitaria has a unique aerodynamic design with the ability to quickly adjust the position of the wing relative to the fuselage when the weight of the payload changes. The minimum tail weight has a positive effect on the control and stability of the aircraft. “Technical solutions, implemented in Sitaria, provide the high level of fail-safety, reliability and security that is required for operation in diverse areas of commercial applications of the UAV,” continued Vadim Tarasov.